Carnival New Orleans News | Sunday, Feb 19 2012 Huge Parade Day! « Saturday’s Parades Changing Days! Sunday, Feb 19 2012 Huge Parade Day! Due to a bunch of rain outs on Saturday, an incredible six parades, including super krewe Bacchus at 5:15 pm, will march down majestic St. Charles Avenue on Sunday. Ever since Comus stopped parading a long time ago, the Sunday before Fat Tuesday has been the longest parading day, with Okeanos, Mid City, Thoth and Bacchus. That day began with Okeanos at 11 am and ended with Bacchus’ last float around 7 or 8 pm, if you are watching from the beginning. 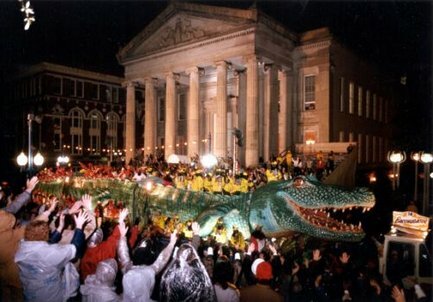 Bacchus is the original super krewe, outsized in all respects. Endymion had very few bands tonight, because of the wet conditions. Bacchus should have all their bands tomorrow. Now, on this particular Sunday, Feb 19, we have the longest parade day with the most parades ever on a single day! This entry was posted by NewOrleansMusicMan on February 19, 2012 at 2:53 am, and is filed under Carnival New Orleans, Mardi Gras, Mardi Gras Parade, New Orleans Hornets, Orleans Parish. Follow any responses to this post through RSS 2.0. You can leave a response or trackback from your own site.